And so, in bizarre mayhem surprises parade by, one after another, including psychological and philosophical ones. To envisage it, sometimes neurologists, who are researching more and more, have no choice but to go to brain banks, such as Harvard Brain and Tissue Resource Center, which sends about six thousand samples of brain tissue from healthy people or individuals with mental or physical illnesses in the form of a square centimeter of the requested region to researchers all over the planet and is hardly struggling to cope with demand. Does my brain know that I exist? 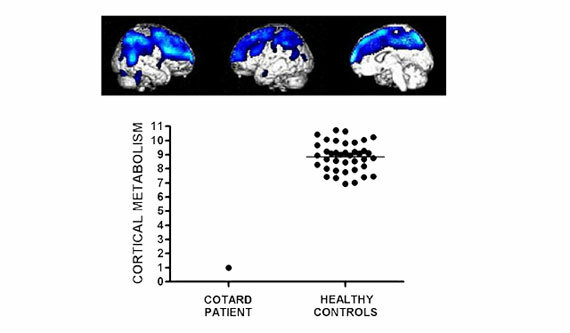 In 2013, a team of researchers, formed among others by Adam Zemar (Professor of Cognitive Neurology at the University of Exeter Medical School) and Steven Laueys of the University of Liege (Belgium), performed the first PET scan on a patient with Cotard’s syndrome (DOI: 10.1016/j.cortex.2013.03.003). This condition was originally known as “The Delirium of Negation” and the first record on which dates back to 1880. That was the year in which psychiatrist Jules Cotard, to whom the disease owes its current name, presented the case of a patient who claimed she had “no brain, nerves, chest, or entrails, and was just skin and bone” and maintained “ that neither God or the devil existed, and she did not need food, for she was eternal and would live forever“. There was a case more recently in which a patient was given a PET scan in 2013. He was 48 years old, with no previous medical history, apart from a short depressive illness, and was treated by a psychiatrist after attempting to electrocute himself. 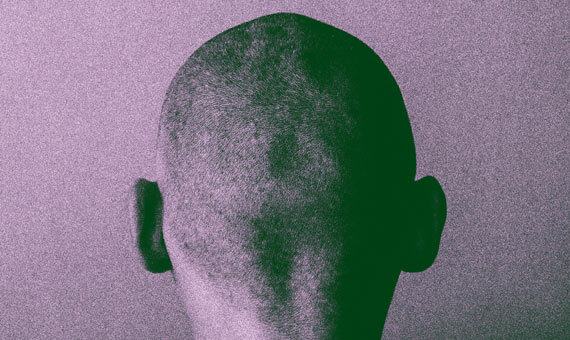 Eight months later he claimed that his brain had died. Psychotropic treatment had little therapeutic effect. Four instruments applied to the patient (the Beck Depression Inventory, Beck scale for suicide ideation, the Hamilton Rating Scale for Depression and the Hamilton Anxiety Rating Scale) revealed severe depression combined with mild anxiety. He was convinced that he suffered brain death, that he was dead, he did not need to eat or sleep, and had a dead brain in a living body. He recognized that his ability to see, hear, think, remember and communicate showed that his mind should be alive, but could not explain how, well his brain, was it dead? He was, to put it in a certain way, living dead. A zombie, as the press would highlight, without paying attention to the technical detail that the patient was not a dead person coming back to life, but a living person knowing he didn’t exist, not for philosophical but neurological reasons. The results of the PET scan that was performed, contrasted with healthy control patients, showed cortical hypometabolism in an extensive set of medium and dorsolateral regions, in a more severe and widespread pattern than in a major depressive disorder. What that PET scan would show is that the profound disturbance of the experience and the thought of Cotard’s syndrome are reflected in the same brain regions responsible for awareness and our abiding sense of me, the so-called “default mode network” area. It’s our body’s interaction with the environment that generates brain activity. If for some reason this interaction fails, there, for example, in areas with low metabolism, like in Cotard’s syndrome, our own sense of existence may disappear completely. And just as the old nobles did not see their heads rolling under the infallible pit of the guillotine and as the man mentioned at the start could tell, not once but many times, the story of how others left with his, in that accident, almost, in their hands, the question of where does the experience that I exist come from, refers to the evolutionary and individual relationship with our environment, thanks to a set of specialized neural networks over time. Way out there, one could imagine a group of these neural networks, specialized in reflection, thought, existence, being or not being, above the rest, neuron philosophers, dominating the world, believing in Platonic ideas the classics would say, illustrated, would replicate Frederick II. It would be a world from another world, where in the morning they prepare and implement the synapses of the day, in the afternoon they would relax and, at night, under the influence of some additional stimulus, they would do what they were really made for, to think about being and non-being, without stopping to think about the old days, where they were still prey of living beings and, said the legend, sometimes rolled around, accidentally.